I hold a 3rd Dan in Combat Ju-Jitsu under Dave Turton and CJJ is what I normally teach, though the slant put on that depends very much on the recipients. The same techniques can, in many cases, be applied to a self-defence, competitive or 'dojo' application. CJJ can be taught in a formal graded manner, or bits can be pulled out for various applications. The picture at left is from the ASMAA Spring Seminar 2013. As I recall the guy about to get his arm up his back was one of a bunch of very game Taekwondo lads who'd ventured far outside their comfort zone. Grappling was very alien to them, which required a different teaching approach to some of the other guys on the seminar. I'm a Master Level Instructor and Senior Assessor in SDF Modern Street Combat as well as holding a 1st Dan in Modern Street Combat. That means I can award grades as well as teaching seminars and appointing instructors. This photo is also from the 2013 Spring Seminar. Basically we're using a 'more violent than skillful' double-leg takedown to break out of a multiple-assailant situation. The SDF Self-Defence Instructor seminars have recently been revamped. 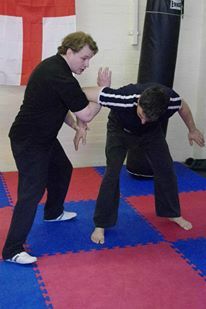 The Basic level is necessary to teach SDF self-defence, and covers both physical and non-physical methods of deterring or dealing with a threat. The body of technique is quite small but very flexible, allowing it to be adapted to almost any situation. The underlying principles inform all the other courses, and include guidance on how to go about adding additional teachniques to the instructor's repertoire. Once the Basic level is completed, specialist courses are available such as Womens' self-defence and Childrens' self defence. These build on the exisiting body of technique and address specific areas of concern to the target group. The ASMAA Coaching for Martial Artists programme exists to create a unified coaching qualification for all arts. It concentrates on delivery rather than content, which obvously requires that the candidate is skilled enough to actually have something to teach before the course starts. Level 1 deals with the nuts and bolts of teaching individuals and classes, such as developing a flexible and effective teaching methodology. Higher levels deal with more advanced coaching such as long-term planning, competition preparation and remedial coaching (ie fixing bad habits).